School kids learn that the first draft of writing is considered the “sloppy copy.” Rereading and revision is the writing process they are taught to use and it’s a good one. This summer you may see it, especially if a piece of writing is due on the first day of school. This Fourth of July, tell your child about how thirty-three year old Thomas Jefferson authored the “sloppy copy” of the Declaration of Independence. It was only after John Adams and Benjamin Franklin suggested revisions that one of our founding documents was ready to change the course of history. 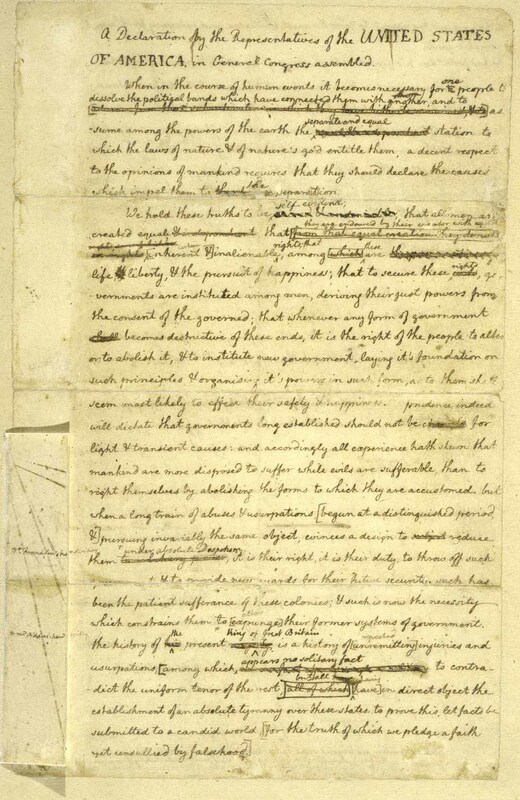 Here’s one view of the Declaration of Independence in it’s “sloppy” form.